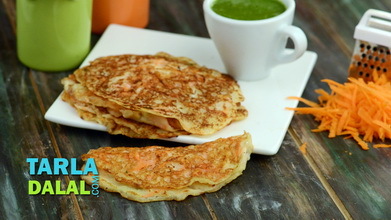 I am sure your little one will relish this stuffed dosa both as a snack and at meal time. 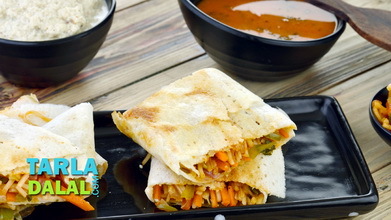 The stuffing is an ideal way of introducing a combination of vegetables to your child's meal. The vegetables not only serve as an important source of nutrients like calcium, iron, vitamin A and fibre, but also give a feeling of fullness and satiate your child for longer periods of time. I've used sprouts here instead of soaked moong because sprouts are easier to digest and also sprouting increases the nutritive value of pulses. Combine all the ingredients along with ¾ cup of water and blend in a mixer to a smooth paste. Cover with a lid and keep aside for to ferment for 15 minutes. Heat the oil in a broad non-stick pan and add the mustard seeds, curry leaves and turmeric powder. When the mustard seeds crackle, add the asafoetida and add all the remaining ingredients, mix well and cook on a medium flame for 1 to 2 minutes. Divide the stuffing mixture into 4 equal portions and keep aside. Pour a ladleful of the batter on the tava and spread it evenly in a circular motion to make 125 mm. (5?) 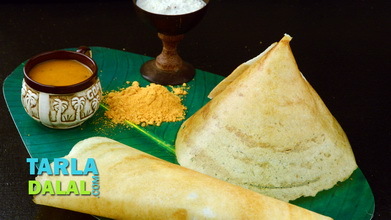 diameter round dosa. 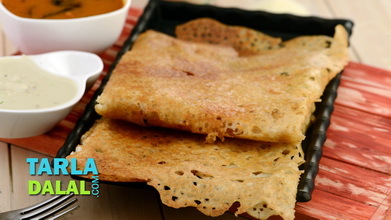 Smear ½ tsp of oil around the edges and cook on a medium flame till the dosa turns light brown in colour. 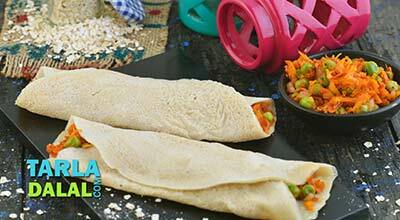 Spread one portion of the filling evenly over the dosa. 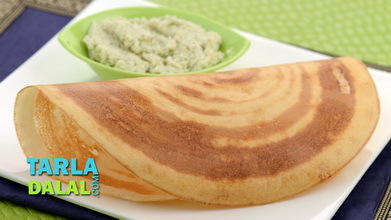 When the lower side of the dosa is lightly browned, fold it over. 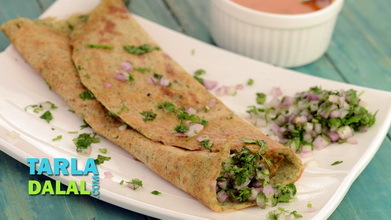 Repeat steps 2 to 5 to make 3 more dosas. 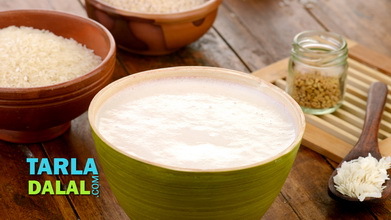 Serve lukewarm with coconut chutney.